Do you feel like you’re living someone else’s life? Values are the key to understanding what fulfills and motivates you, what’s most important to you and what you need in your life. If your highest values are out of line with your work or not present enough in your life, you’ll feel dissatisfied, restless or unhappy – and you probably won’t know why. When was the last time you made a conscious choice that you knew was right for you? When you know your highest values you have solid ground to stand on when storms hit. You’ll have an anchor to what matters most and be able to make a confident decision that this is the right choice for you. When your actions are aligned to your values, decisions are easier because they flow from truth and you won’t be paralysed by procrastination because you’ll know your choice is made from your values. When I left a well-paid and reliable job to build a life and career that is genuinely and wholeheartedly me, the moment I put faith in my values as my guide, the decision was made. When I have doubts, or life throws me a curve ball, I stand in my values and know what I have to do. If, like me, one of your values is authenticity, making values-based decisions is the most authentic path you can take. When my clients have discovered their top values, good decisions flow. Ready for an authentic life? In the 2-step Freestyle Values Discovery package you’ll get clear on your top values, understand exactly what they mean to you, how fulfilled they are in your current life, and know how to strengthen and use them to make better decisions for the life you want. You'll be confident that you can access your values to guide you to authentic decisions and to connect more genuinely with your clients, colleagues and those you love. Through one-to-one coaching and reflective tasks between sessions, you’ll gain values clarity and the key to a life that is true to who you are – a life in which you can thrive. These are my highest values. Are you a business owner who is uncertain about the authenticity of your brand? Do you find yourself struggling to truly express who you are, identify and express your authentic values in the work you do and the clients you want to serve? The Values Discovery Package will help you get crystal clear on what your values-driven brand truly is. If you're clear on your own values, it's so much easier to genuinely connect with your ideal clients, craft services and products that align with what you prize most - and what will attract your perfect collaborators and clients. What's included in Values Discovery? 2 x 1-hour coaching sessions to identify and understand your values and how to express them more fully in your life. Reflective tasks between sessions to dive deeper and achieve the clarity you need to confidently shape a life aligned to your values. You can arrange sessions to suit your schedule and we’ll be in email and video contact throughout the process. All learning materials are provided. ‘I am in the right place right now. 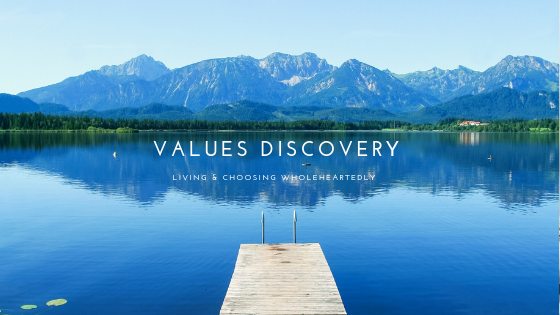 To find if the Values Discovery package is right for you and whether we will be a good fit in the coaching relationship, click the button to arrange a free 30-minute discovery session.